The perfect tenses are usually the last learned in the tense system. Adverbs, Past Participle, auxiliary verbs are all needed to form this tense! Present perfect is just one of the nine tenses in English. Study adverbs and you will understand the importance of describing time and frequency in English! 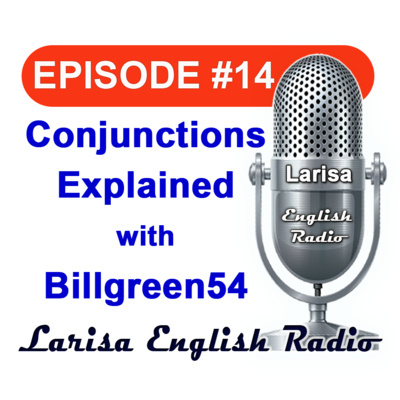 Billgreen54 explains American English in simple and understandable lessons! Adverbs are one of the most important parts of English to study! Why? To better understand how to refer to time. Most ESL students do not take the time to study adverbs! Have fun with Bill as he explains American English! Present Perfect Simple is just one of the tenses in the English language! The use of adverbs and time expressions is extremely important with all tenses unless the listener knows the time you are referring to. Have fun with this lesson. We often use past simple and past continuous together. While doing something as an action, we often make a statement of fact. 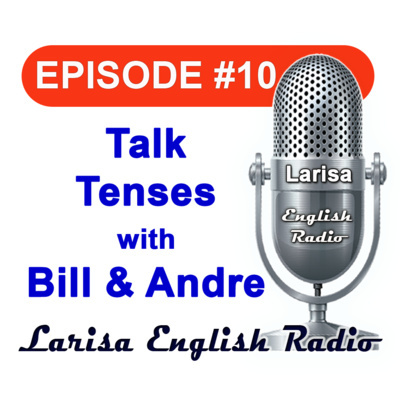 Bill explains these tenses together in simple English! How many irregular verbs are there in the English language? That all depends on who you talk to! However, there are close to 150 irregular verbs used everyday. Have fun with this episode! Connecting thoughts in an understandable statement is not always easy for learners of English! Bill explains linking words in this episode! How do we create a sentence that makes sense? 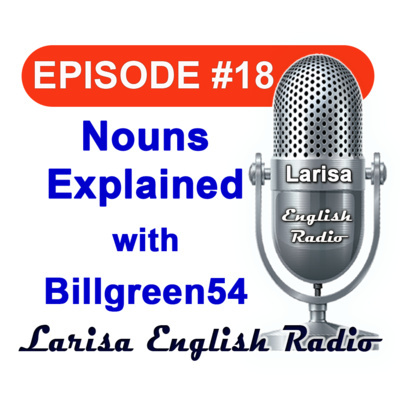 Billgreen54 explains linking words in this episode! Reasons and why linking words are part of everyday English! Find out how to use them in this episode! Will and going to are used many ways in English. Study tenses and you will be speaking great English in no time! What is future present continuous? Actually, there is no such tense in the English language! The truth is that we use present tenses for the future more than future continuous! Find out how in this episode! Understanding what others are saying is critical in everyday communication. While most speakers of English don't need to speak using phrasal verbs, they should be able to at least understand the most commonly used! Phrasal verbs are essential to everyday English. Phrasal verbs are more common than most learners of English think! Have fun with this episode! Phrasal verbs are countless! There are so many but, there are less than 100 that are used everyday. Have fun with these six phrasal verbs explained by Billgreen54! Study all of the English expressions in our podcast and you will be well on your way to better communication! Have fun with this one! Expressions come from everywhere! Movies, friends, teachers... Study Expressions with Billgreen54 and learn more ways to have fun with English! 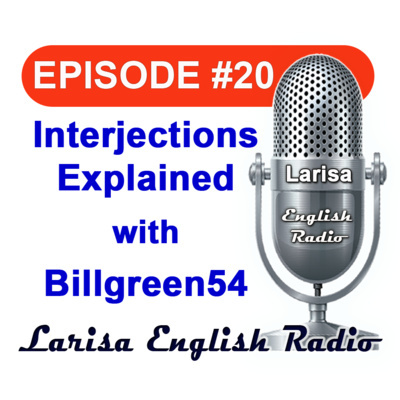 Billgreen54 has created a special episode for you today with twenty one English expressions used everyday. English expressions are used in everyday speech! Learn how and why in the episode! How many ways do we use past simple. It is more than you might think! Learn more with Billgreen54! How many ways do we use present simple? Find out in this episode with Billgreen54! Do you remember the difference between cardinal and ordinal numbers are? Take a few minutes and let Billgreen54 help you with that! You should already know the days of the week, months and the alphabet. You might need a little practice with pronunciation. Billgreen54 helps with just that! Adverbs play a more than important role in English! Study English with Billgreen54. What, why, when, who, where, why? Question words are used very differently in English. Bill explains English understandably! Say and tell are often confusing for ESL students. Bill explains these two special verbs in simple to understand English! Come and go are used much differently in English. Bill explains English in simple to understand ways! Here are 50 of the most commonly used phrases in English. Bill does a great job explaining English! Could and would are two of the most common modal auxiliary verbs in English. Have fun with this English lesson with Bill. Should have is often used for advice! Find out more when Bill explains American English! Could have & would have are used the same as the adverb "Maybe"! The top 100 common words in American English spoken by Billgreen54! The article is used countless ways in English! Let Billgreen54 help you with you English! What are stative verbs? Bill explains American English in simple terms! Stative verbs are all about facts most of the time! Bill explains English in simple terms! Stative verbs are generally not used in continuous tenses! Remember that most rules in English have exceptions. Study your tenses with Billgreen54! 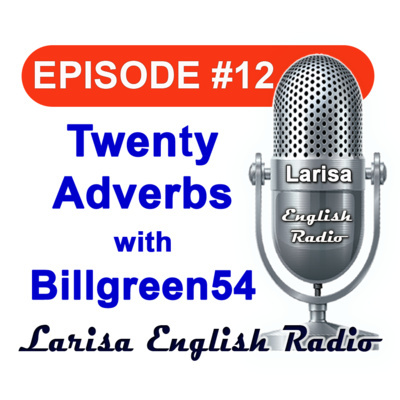 Bill explains twelve tenses in American English! Billgreen54 explains an important future tense! Bill explains the many different ways to use future simple! Past perfect progressive is much different than past perfect simple. Bill explains why! Future Perfect Progressive is the least used tense in English! Billgreen54 explains why! Future perfect is just one of the tenses in English. Bill explains English in simple ways! Adjectives are all about words that describe! Billgreen54 ESL teacher helps with your English! Short forms are contractions in spoken English! Writing in short for is much different! Billgreen54 explains why! What are homophones? Have fun with This episode! Questions are always the most difficult part og English for students. Bill explains why! One of the most used verbs in English. The verb "Do" is explained in simple terms! 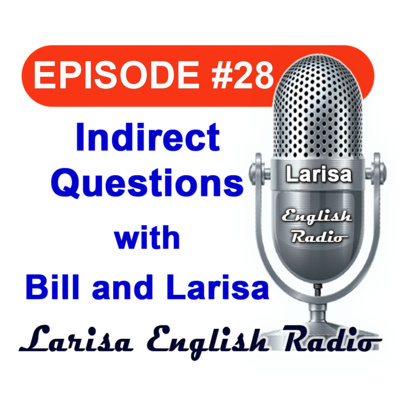 Bill explains how to create questions with the verb to "Be" in simple terms! Bill explains reported speech in the episode! Active and passive voice! What are they and how do they work? Billgreen54 explains in simple and understandable ways! Past perfect is not that difficult when Bill explains how and why! Modal auxiliary verbs are always an interesting subject. Have fun with this episode! Second conditional is all about what might or will happen! Bill explains it in simple terms! Bill explains first conditional in simple understandable terms! Have fun studying English with Billgreen54! What is subject verb agreement? Find out with Billgreen54! Indefinite pronouns are just one part of pronouns and the eight parts of English. Let Bill help you with your English learning journey! Quantifiers are all about how much or how many. Bill explains English in understandable ways! Used to is just one of the many ways we refer to the past, present and future! What are indirect Questions? Find out as Bill explains in simple terms! Take the time to study relative clauses with Billgreen54! There are many movement prepositions in English! Bill explains the most important! Place prepositions can be confusing! Bill explains English in simple terms! Time prepositions must be learned by heart! Bill explains why! How to ask and answer questions? Help is on the way with Billgreen54! Every sentence in English must have a verb! Bill explains English in simple understandable terms! Comparative adjectives... How do we compare? Bill explains in simple terms! There is a big difference between past perfect simple and past perfect continuous! Find out more with Billgreen54! Present Perfect gets easier and easier when you take the time to study adverbs and past participle! What is the difference between past simple and past continuous? Find out with Billgreen54! How do we connect words to words? Find out in this episode with Bill! Will or Going to? American English! "Will and Going to" are both all about the future, right? Not exactly! The good news is that this episode is all about the future! The past simple tense is not difficult once you have studied your verbs in all three forms! Billgreen54 explains English in a simple way! Present continuous is used many ways in the English language. Billgreen54 explains why students should study present continuous again! Present simple is the first tense an ESL student learns! Billgreen54 explains in simple English how this tense works! Present Simple Question Words Explained! There is a lot to the subject of the tense system. Present simple is no exception! Questions are often the most difficult to learn! The tense system starts with present simple. Questions are always the most challenging! Positive and negative are easier to learn but, we need questions too! How do we talk about the future? One way is to use "Modal verbs!". Billgreen54 explains modal verbs in a simple and understandable way! What are empty verbs? Another important part of English! Empty verbs have no single definition! Empty verbs help create phrases! Learn all about Empty verbs with Billgreen54! How is one of the many question words in English! It is used many different ways in English. Billgreen54 explains the "How" in simple terms! Easy to understand tutorial with Billgreen54 in American English. Modal verbs are an interesting part of English! Modal verbs are used in so many ways! Why do we call them "Modal auxiliary verbs?". Because they are always used with another verb! Simple right? Well maybe:) Learn more with Billgreen54! Travel idioms in American English! Why do we need travel idioms? Most of the time, it's all about a better understanding of what the other person is saying! Business idioms are everyday English. It's good to know a few to know what others are saying to you. 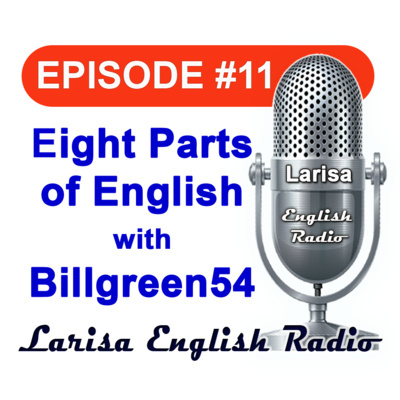 American English with Billgreen54. Time management vocabulary is something every ESL student needs! It is a part of English that is usually last on the list to study. Let Billgreen54 help you with you American English now! Project management vocabulary in English is rarely easy for ESL students. Bill helps you with basic words and phrases to make your job a little easier! Projects are part of everyday work! Vocabulary is a part of English a person never fully learns! Have fun with Bill as he explains project vocabulary! Travel adjectives are always helpful! Take the time to study travel adjectives and have fun! Billgreen54 will help you describe your travel experience! What type of manager are you? Can you describe yourself or your higher up? The lesson has everyday vocabulary for you and your job! Join Bill for another informative English lesson! The workplace is always challenging for ESL students. American English is different than British English in many ways. Billgreen54 explains terminology that will be helpful! Make your English just a little better with a few common words in English. This lesson is more than just English. Learn more with Billgreen54! The job interview is a great lesson in both applying for a job and English! Billgreen54 shares a few basic thoughts about getting that job! American English is a language that is spoken worldwide! Question tags are just one small part of communication. Study with Billgreen54 in plain simple English! Negative question usually are not questions at all! Learn more with Billgreen54! Indirect questions are used in everyday speech! Advanced speakers of English use this grammar to ask questions politely! Join Bill and with this interesting English lesson! Indirect requests are an extremely polite way of asking for something! 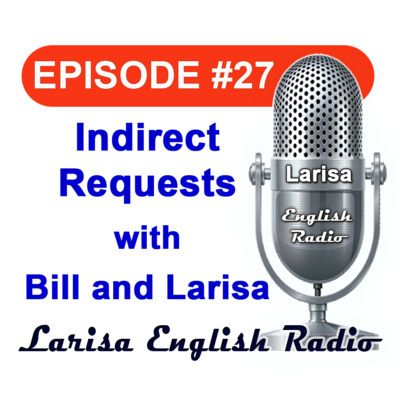 Bill explains what indirect requests are all about in this episode! In American English, the word "Goodbye" is rarely used. This is unless you never want to see someone again! There are other ways to depart! Billgreen54 explains what this is all about! What do you say when you meet someone for the first or second time? What about yesterday or tomorrow? Have fun with the episode! Adverbs are always a fun subject. Yesterday, today, tomorrow are all time adverbs. We can't live without them! 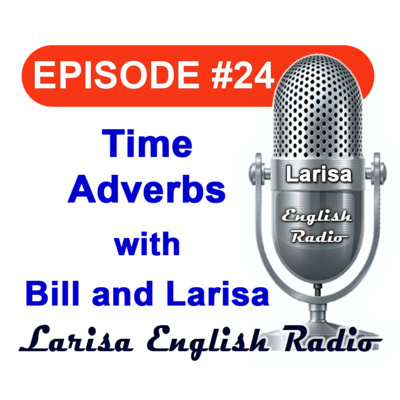 Bill and Larisa share time adverbs! Partitives are used to help determine how much or how many! Have fun with Bill and Larisa explain partitives! 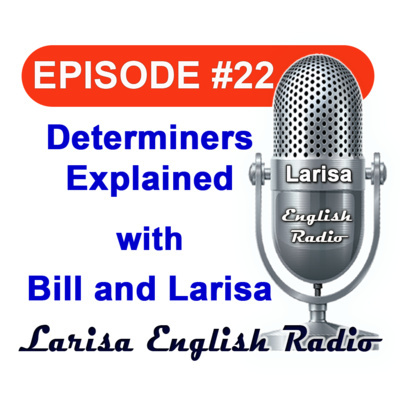 What is a determiner? It's a word that helps determine what noun we are talking about! That is a simple definition! Find out more in the episode! Passive voice or active voice? When do we use passive and why? Have fun with this episode! Just about any word in English can be used as an interjection! Do you know that? Interjections are always a fun part of English. Billgreen54 will help you understand why we do what we do in the English language! Pronouns replace nouns! 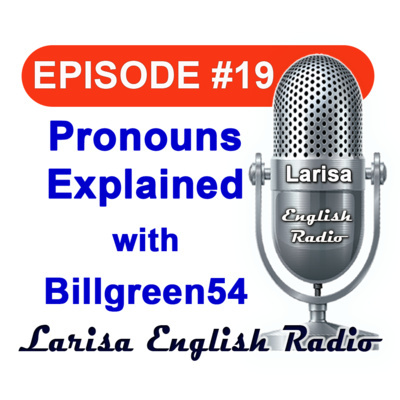 Pronouns are just one part of the eight parts of English:) It's time to think about why we really use pronouns. Study English with Billgreen54! Most nouns are also verbs! Nouns can be adjectives! Two nouns put together to create a new word are called compound nouns! Wow! Fun subject. Billgreen54 offers his thoughts all in American English! Tongue twister? It's a metaphor! Don't take it literally! Tongue twisters are a fun part of English. Bill has fun with this subject! Verbs are an interesting subject for many reasons. Verbs can be nouns! Verbs can be adjectives! Verbs are used to create phrases! 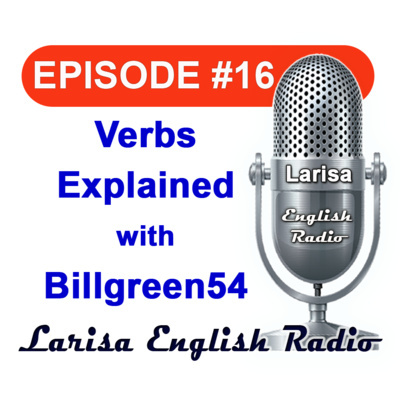 Billgreen54 explains verbs in American English! Prepositions start out with a few simple words... "At, On, In"! Simple right? Well, maybe! Did you know that these three prepositions are prepositions of "Place"? Learn more with Billgreen54! Conjunctions connect! They function as a connector between two sentences, clauses, phrases, or words! Cool right? One simple rule to remember! Conjunctions never stand alone! Let Billgreen54 help you improve your English! Adjectives are just one of the eight parts of English! It is so important to hear English explained by a native English speaker! Simple terms and easy to understand grammar! Bill explains English understandably! Adverbs are the most important part of English to study! Why? Because most students of a second language fail to fully understand what adverbs actually do! 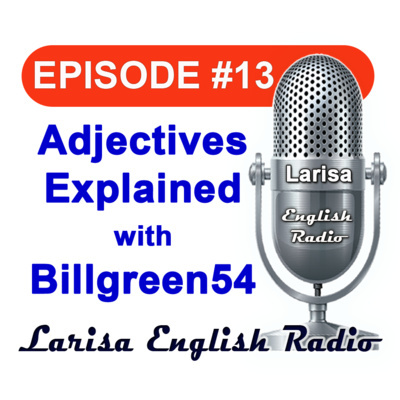 Have fun with Billgreen54 while he offers his thoughts about adverbs! When was the last time you studied English? Do you remember why we use verbs? Did you most nouns are also verbs? Fun stuff! Have fun with Billgreen54! Every sentence in English refers to at least one tense. Thinking tenses and why we use them is always a good idea! Adjectives are always a fun subject! 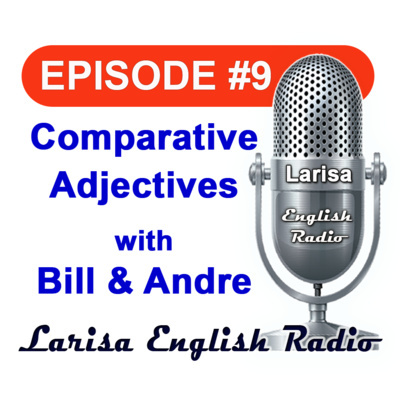 Have fun with Bill and Andre while they discuss how to compare! Teachers usually stay away fro bad words in English. Teaching bad words to ESL students is never a top priority! That said, sometimes there is a need to talk about "Bad Words". 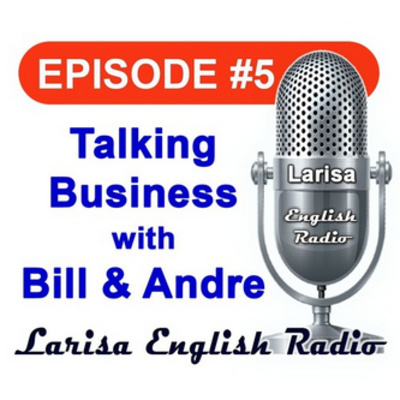 Join Bill and Andre when they discuss English! Do you know what part of English "Fiddlesticks" falls into? Have fun with this episode! Business and business English is always an interesting subject. Andre is an experienced business owner. He has visited and lived in many countries. Business in Ukraine is always an interesting subject to discuss while studying English! 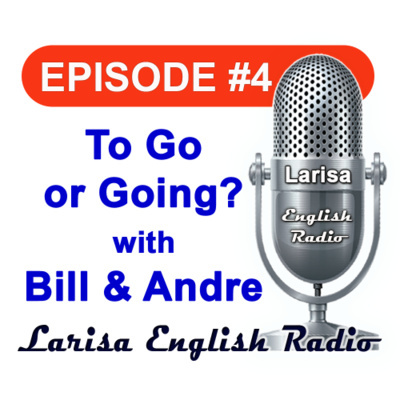 Bill and Andre discuss "To go and Going" in today's episode. Verbs are always a challenge for most students of a second language. "To go and going" are used differently in English. Collocations play an important role in all verb usage! 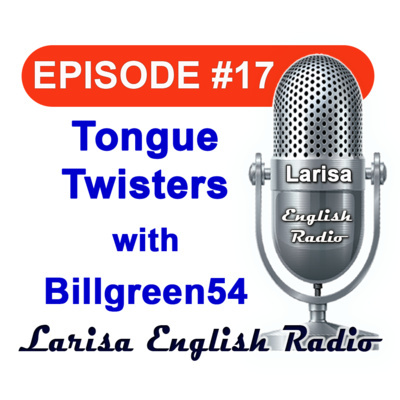 Join Billgreen54 and Andre for this interesting episode of Larisa English Radio! 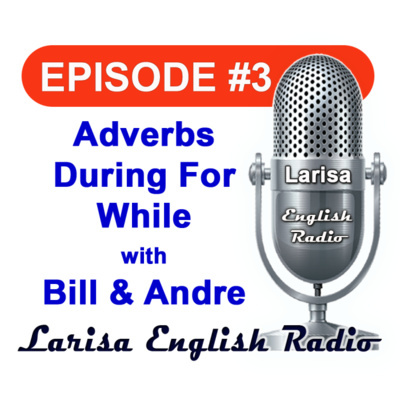 Bill and Andre share thoughts and give adverb examples! Adverbs "For, During, While" are used differently in American English. Have fun with Andre and Billgreen54 while they share examples and more! Present Perfect is just one of the twelve or less tenses in English. Tenses start with present simple and get more complicated from there! 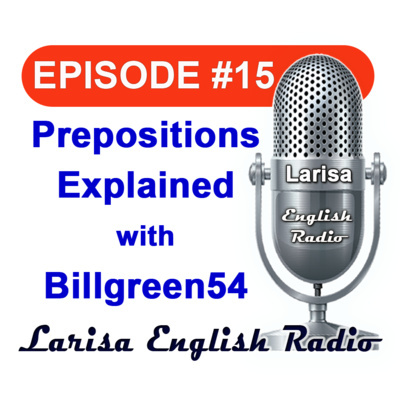 Billgreen54 explains American English grammar in simple ways to help you easily understand! Join Bill and Andre for an explanation and example podcast! Reported speech is often challenging for students of a second language. Andre has studied English for years. Like all students young and not so, he needs a reminder from time to time. Speaking English is one thing. Knowing why we do what we do is another! 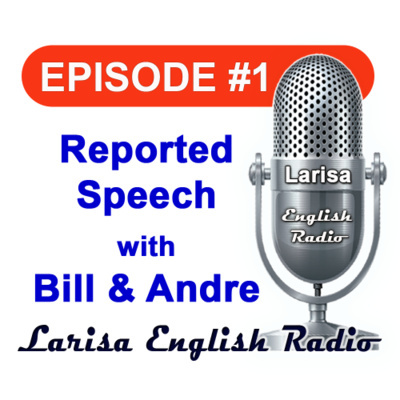 Join Billgreen54 ESL teacher and have some fun with reported speech!